What a brilliant post! How this letter found among Cromwell’s things slipped by me during my research for SECRET DIARY I’ll never know. But to my ear it sounds like pure Anne. And it does have distinct similarities to the speech she gave at her trial. I’m with the 19th century biographers. Thank you for adding to my understanding of my favorite queen. Hello Robin!!! It’s been way too long since we talked. My term ends soon. Shall we plan a phone call? And thank you for the lovely comment! Would LOVE to catch up on the phone once your term ends. Just give me a shout when you’re free. I’m writing (a lot), but on no particular schedule. As I now can return to “The Tudors,” I find Susan’s post about this possible letter of Anne’s very fitting. Enjoy! An interesting train of thought. Thanks Lisa! And never say never….Who knows what may turn up? Brilliantly written argument and the letter does most certainly keep the timbre of Queen Anne’s final speech. My question would be what personal gain would someone have in forging the mentioned letter? It seems to me that anytime someone forges a document, they do it to benefit somehow. And; if it was forged why did Cromwell keep it? Good questions, Mary! 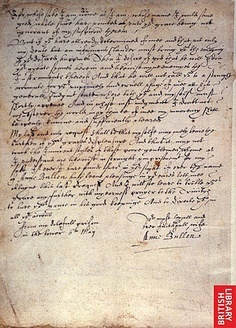 The discovery of the letter was first mentioned in bios written during and after the Elizabethan period (first by Lord Herbert in his 1649 “The Life and Raigne of King Henry the Eighth” and then by Bishop Burnet in 1679), when Anne, as the mother of Elizabeth, was being looked on more sympathetically by Protestants. Burnet says he found it, along with Sir William Kingston’s letters, “lying among Cromwell’s other papers.” But some thought it was planted there by an Elizabethan defender of Anne. Thanks Susan, validating a person for religious conviction and justice could motivate a forgery. However, I am still leaning towards your reasoning that it is very possible that Queen Anne wrote the letter. I wish someone could pinpoint the date the parchment that it was scribed on. If Anne didn’t write it, she SHOULD have. I lean toward believing it’s authentic and what we have is a copy made by Cromwell’s secretary. Before the 1731 fire that burned some of the remaining records, John Strype claimed to have seen a second letter from Anne in which she furiously rejected a plea bargain which would require her to confess. (Probably wise of her, because I believe Henry would have killed her anyway, and would have been delighted to wave around “proof” of her crimes.) Perhaps the original of Anne’s “From the Lady in the Tower” letter was destroyed with it. I never could fully agree that the letter was not authentic. Personally, I feel like the Anne Boleyn I’m familiar with would never go down without putting up a fight, which in this case, may or may not be this letter.